Playwrights and their translators. L-R: Brett Donahue, Laurence Dauphinais, Letícia Tórgo, Michael Mackenzie, Maryse Warda, Rébecca Déraspe, and residency leader Bobby Theodore. Not pictured: Denis Côté. The Glassco Translation Residency, popularly known as "Tadoussac", is an engine of cultural exchange like no other. I've had the great good fortune to be in it (and write about it) three times. This year I want to zero in on a single remarkable discussion. 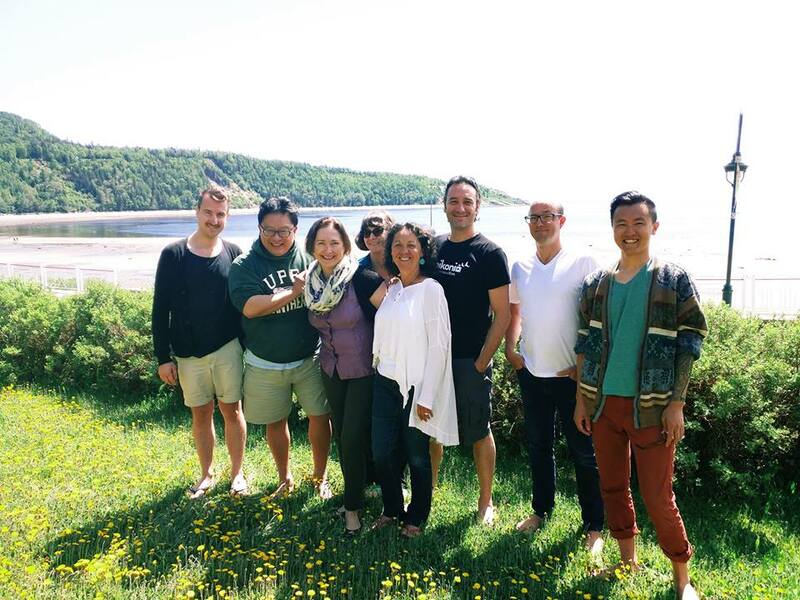 It was maybe two-thirds of the way through our ten-day retreat at the Glassco family's beautiful summer home in Tadoussac, Quebec. Playwright-translator teams were gathered round the cosy fireplace for our 5-à-7... the nightly pre-dinner confab where we discussed our specific projects, as well as the larger questions of cross-cultural work, over a bottle or two of good French wine (which is cheaper and more available in Quebec than anywhere else in Canada). With my beloved collaborator, the gifted Rébecca Déraspe, I was about to launch into a little presentation of our translation-in-progress of her vivacious and audacious feminist comedy, Gametes. I took a deep breath. My reaction to this very reasonable and kindly-meant comment? A sort of deer-in-the-headlights freeze, mixed with an oddly familiar red rush of emotion. Suddenly, after some years of being considered reasonably proficient in my adopted language, I once again felt like the unacceptable Other. When you, as a non-native speaker, are invited to talk in "your own" language – or when the person with whom you're speaking makes the decision for you, without asking, by simply switching into your native tongue – you experience it as something worse than a mere inability to "pass" (a politically dubious goal I gave up on years ago). While I'm sure this is seldom the speaker's intention, it almost invariably feels like a verdict that you're not good enough. Too unpleasant to listen to, too incompetent to wait for. Obviously struggling to communicate. A failure. In other words, I was feeling exactly the thing that prevents most English-Canadians from ever, ever speaking the French they picked up in school. It's called shame. Just for context: my French is the product of a unilingual small-town kid's immersion in a French-speaking Toronto high school with a very international teaching staff, curriculum, and student body. Add to this a lifetime of slowly, painfully acquiring something my education never gave me: a working knowledge of Canadian French. I'm not particularly proud of my French, but I'm extremely grateful for it. There's a difference. Back to our evening circle. I was about to stammer out some reasons why I wanted to discuss my work in French – while trying not to sound defensive or hurt – when something wonderful happened. Everyone else spoke up instead. In French. One colleague said simply: "You know what? I'm an anglo. I live in Toronto now. I have a strong accent, and I used to be very self-conscious about that... but I'm also a Montrealer, and a Quebecker, born and raised. And I'm bilingual. And this is my language, too. And I'm going to speak it." One of the francophones, meanwhile, talked about how she had been involved in multiple artistic residencies and environments that were supposedly bilingual, but wherein everyone defaulted to English within a few short days. "This is the first so-called bilingual residency I've been in where the working language is French, where the anglophones and allophones consistently make the effort to express themselves in French... and personally, I find it very moving," she said. "Ça me touche." "Well yes," said the original speaker – who is a wonderful artist and a supportive colleague and friend. "I was just trying to make things easier for everybody. And I'm just... surprised, that you [English-speakers and allophones] are all sticking with it. In all my years of working in the theatre, I've never seen anything like it." We all agreed. And carried on. In French. This was, for many reasons, an extraordinary conversation to be having in Quebec, where language and culture have long been inseparable from politics and power (and from a bitter and still-recent history when rich bosses all spoke English... while their impoverished workers spoke French). It was a conversation I could not have imagined taking place twelve years ago, when I first came to Tadoussac and was taught so much about Quebec language, culture, and politics by the great Linda Gaboriau. It was a conversation that made me proud of us all – francophone, anglophone, and allophone – for being open to each other, really speaking, really listening, really willing to forgive each other's missteps and misfires on the way to a deeper understanding. It is, IMHO, why we truly need Tadoussac. L-R: Olivier Sylvestre, Jovanni Sy, me, Alexis Diamond, Beatriz Pizano, Charles Bender, Pascal Brullemans, Derek Chan. Not pictured: Bobby Theodore. "Tadoussac, from the Innu word meaning "bosom" (refers to the capes on either side of the mouth of the Saguenay River, where the whales come to feed)"
Ah, Tadoussac: the place that nurtures both translators and whales. When I first came to the Glassco Translation Residency, I'd already had over a decade of experience as an actor and playwright, with a sideline as a commercial translator that helped keep my fridge full and my French alive. When I left, I had the draft of my very first play translation, Philippe Soldevila's Tales of the Moon... and much had changed. Within those ten days, I had been mentored by Linda Gaboriau, the preeminent translator of Québecois drama into English – an elegant and scintillating figure, in person as in prose. I'd shared good Charlevoix cheese, cultural insights, and theatrical war stories with some of the most exciting playwrights and translators in the flourishing theatre scene of Québec, as well as the translator and director Shahin Sayadi from Halifax, and the playwright Greg MacArthur from... pretty much everywhere. Moreover, I'd had a crash course in the thorny/ubiquitous politics of language in Québec... not merely as a topic of intellectual interest, but up close and personal. Everything about me – not only my aptitude and motivation for doing the work, but even the very way I speak the French language (halting-to-fluent mid-Atlantic diction, peppered with jarringly Québecois expressions) – was analysed and challenged. It was hard and it was bruising at times, but it left me with much greater skill, increased self-awareness, and renewed determination. Linda, thank heaven, steered me through it all. Now, ten years later, I was finally going back, to work with Olivier Sylvestre as I translated his first play, La Beauté du monde, for Pi Theatre. Of course, things were very different this time. Linda had left the leadership of the residency in the capable hands of her protégé and friend Bobby Theodore; there was a whole new group of artists; and the languages being worked in included Cantonese, Spanish, and N’lakap’mux as well as English and French. Meanwhile our societies have (d)evolved in many ways, and our theatrical cultures along with them. Furthermore, I'm different. I'm a mid-career theatre artist now, and a translator with over a dozen plays to my credit: five of them have been produced to date, and three published. I'm no star, but I have a process, and a track record, and fewer and fewer fucks to give about what anyone thinks of my French. What hasn't altered, is Tadoussac. Not really. It was spring instead of fall this time, so the spectacular sunsets were later every night: but the whales, the rocks, the pretty painted village on a bed of wild... the lovely and spacious old ten-bedroom cabin crammed with folk art, solid wooden furnishings, Bill Glassco's Tarragon Theatre memorabilia, and first-rate books... all were as I had left them. Like the apartment building in La Beauté du monde, the Glassco family's summer home is a character in itself... but instead of the carnivorous beast of Olivier's oneiric and haunting play, she is a gracious and welcoming small-town aunt who offers you seconds of everything. Just as before, ten days of hard work, laughter, cultural exchange, and linguistic insights were enjoyed by all, with evenings full of good food (merci, Andrée) and good wine. It's still the way you always imagined university would be: the perfect cocktail of solitude and togetherness, communal life and the life of the mind, garnished with long, companionable walks. The sort of environment where Olivier could peaceably translate Jordan Tannahill on one end of the comfy old sofa while I was translating Olivier on the other... and we could help each other when we got stuck. Where my husband and I could both take part, thrilled to be sharing this special place, but spending most of the day delving deep into our separate projects with our separate creative partners. Where Charles could whirl Bea into an impromptu ballroom dance, while good-naturedly arguing about who was going to lead. Several of us opined that we could easily live this way for ages... except that we would miss our loved ones, actual theatre, and Asian food. Actually, the biggest shift I noticed in the residency itself was generational. Bobby is a much more senior translator than I am, but age-wise he is more or less a peer... as were most of us this year (sparkling Alexis, profound Pascal), except for those (Olivier, Charles, rising talent Derek Chan) who were younger. On my way home, I had a wee drink in Montréal with the brilliant translator and filmmaker Shelley Tepperman, who since that first residency has become a dear friend. She said that, much as she hoped to go back to Tadoussac and felt that Bobby was a great choice to lead, she would miss Linda's stories; the breadth of her experience; her ability to draw on a lifetime of important work with the great figures of our time in order to guide the rest of us and put everything into perspective. "Yeah," I said. "But I'm realising that, sooner or later, we're going to have to start doing that, too. Passing on whatever we know to the next generation... including Linda's stories. I mean, that's what we do, as translators, right? We transmit what we love, to the best of our ability, to the people we hope will care about it?" "I know," I replied. "Me, too." 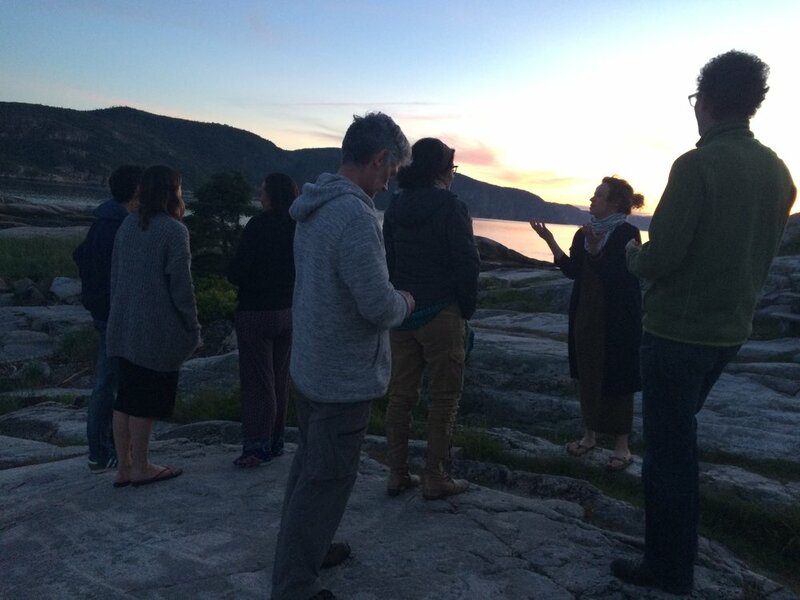 The annual Glassco Translation Residency in Tadoussac, Québec is Canada's only artist residency focused solely on the translation of plays. My thanks to Playwrights Workshop Montreal, Pi Theatre, and Richard Wolfe for this priceless opportunity... and to Briony Glassco and the Glassco family for opening their incredible home every year. You can read more about my translations here.